THE FLAVOR MEGABEAST - VANDY VAPE BERSERKER!!! THAT'S WHAT WE CALL STARTING THE WEEK RIGHT! The winner of the lottery #982 for THE FLAVOR MEGABEAST - VANDY VAPE BERSERKER!!! was Róth Balázs from Székesfehérvár , Hungary on Jul 30, 2018. The Berserker MTL RTA by Vandy Vape's first atomizer specifically geared for mouth-to-lung vapers, based on a flavor-orientated design with a funneled chimney, a 5-setting dynamic airflow adjustment mechanism, and an extremely user-friendly two-post with clamp system. 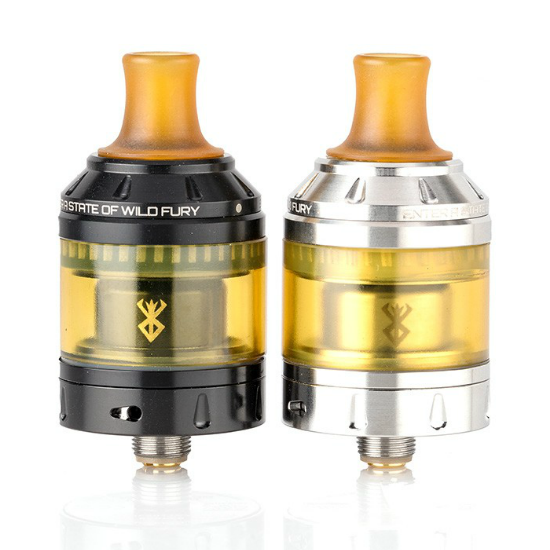 Measuring 24mm in diameter, the Vandy Vandy Berserker sports a standard juice capacity of 2ml with the option of expanding up to 4.5ml with the included spare glass and chimney extension. As one would expect, the tank is easily refillable by a threaded topfill method, a system that when opened, exposes two large filling ports that feeds directly into the liquid reservoir. Another key quality of the Vandy Vape Berserker is the supremely worthy dynamic airflow control system that allows 100% precise customization with 5 different adjustments that lets you choose from airholes 0.8mm to 1.6mm wide. The deck is configured for easy building and integrates a two-post format where coil leads are placed under the flathead screws and secured at the top for a solid connection. To wrap it all up, the Vandy Vape Berserker comes with an an ULTEM drip tip for mouth-to-lung vaping, as well as a 510 Delrin mouth-to-lung drip tip.